George Clinical provides a broad range of clinical research services, including global scientific leadership, for studies into the world’s most prevalent airway diseases, including asthma and chronic obstructive pulmonary disease (COPD). In the Asia-Pacific, asthma and COPD are particularly relevant as risk factors such as smoking, biomass fuels, pollution, and tuberculosis (TB) are higher than in other regions. Most asthma related deaths still occur in low-to-mid income countries. COPD is currently the fourth leading cause of death, expected to become the third by 2030. COPD patients are also severely affected by co-morbidities such as heart disease and diabetes, two of George Clinical’s key areas of expertise. Christine has been principal investigator and has led many investigator-initiated and competitively funded clinical trials in airways disease. 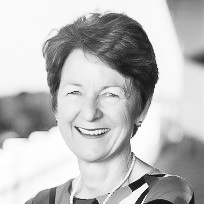 She has had major roles in advocacy and leadership for lung health in Australia, chairing the National Asthma Campaign, the Federal Government’s National Asthma Advisory Group and many local and international guidelines and implementation initiatives to enhance resources, skills, capacity and clinical outcomes in airways disease. 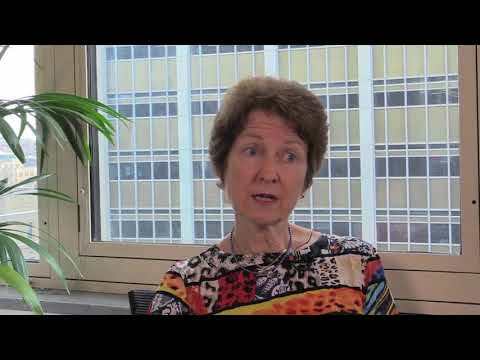 She was president of the Thoracic Society of Australia and New Zealand from 2007 – 2009. Christine is an active clinician, and teaches and supervises medical students, advanced trainees and post graduate students. Her area of research interest is the clinical management of airways disease and patient reported outcomes in response to therapeutic interventions, and she is currently implementing trials in asthma and COPD management and pulmonary rehabilitation in Australia and Asia. Christine has written two books on asthma, one for medical students and one for patients, their families and carers. In 2002 she was made a Member in the Order of Australia for recognition of service to respiratory medicine as a physician, administrator and educator, especially in the field of asthma education. She is on the Board of the Lung Foundation Australia, and is a member of the Thoracic Society of Australia and New Zealand, the American Thoracic Society, European Respirator Society and the Asian Pacific Society of Respirology. Severe asthma is actually a problem for only a small proportion of all people who have asthma. If you look particularly in the western environments where asthma prevalence is very well understood and measured, severe asthma probably accounts for only around 5% of all the people who have asthma. The important thing about this, is that we used to say severe asthma was if you had a severe attack and you ended up in hospital or even had to have something like an intervention such as intensive care or ventilation. We now know that many people who might have presented like that don’t have severe asthma at all, they simply didn’t take medication for their asthma. So we now define severe asthma as asthma symptoms and abnormal lung function that persist despite optimal medication, both adherence and prescribing of appropriate medication and when you know for certain that the patient is adherent and they’re receiving the best possible medications on offer, and they’re pursuing a healthy lifestyle, but they still have symptoms, abnormal lung function and exacerbations, then they have severe asthma. People with severe asthma can be of any age, they can be from as young as five or six years old through to 96 years old. Anyone can have severe asthma. There are particular features about severe asthma that tend to mean that it more often affects people in their young adult life and through to their middle adult life. More typically severe asthma will occur in someone who has had lifelong asthma since childhood, it very rarely affects somebody who had very trivial or mild asthma in childhood suddenly in their later life getting severe is not the usual pattern of events, it’s much more normally something that declares itself in childhood or adolescence as an aspect that means they are never completely symptom free. Their treatments are never completely controlling their events, in terms of exacerbations and so they’ve never had a prolonged symptom for an interval, where as many people with asthma who are well treated achieve very prolonged periods without any symptoms, as long as they’re taking their medication. Somebody who has a severe asthma attack can have either very sudden onset of very extreme breathlessness where they can’t breathe, they would often describe themselves wheezing and not getting relief from their inhalers, particularly their reliever medication, where they step up very quickly when they become much more breathless; these events can be brought on by a huge range of different triggers, things like a viral respiratory infection, is a very common trigger. On the other hand, sudden exposures to things they might be allergic to, things like cats and dogs or severe reactions to moulds or house dust, if the burden is big enough. But for some people, it’s just an evolution that never has a complete answer, you can never entirely say what brought it on, but their asthma gets out of control. Lots more symptoms, very breathless, coughing, wheezing, can’t really do their usual things, don’t get relief from their reliever medication and when that happens they need a lot more anti-inflammatory, they need oral medications as well as inhaled and they may well need very frequently do hospital admission and occasionally intensive care admission and assisted ventilation. So a severe episode can be life threatening. The prevalence of severe asthma in Asia is really not fully documented. There are some countries that have attempted asthma epidemiologic studies, but the prevalence of asthma in Asia is lower than it is in many Anglo-Saxon western countries. So in Australia for instance, the prevalence of asthma in adults is around 12%, in children around 18-20%. In Asia, it’s about half that and as I mentioned to you, there is also only a small proportion of people with asthma who have severe asthma. So we have to presume that in Asia, it’s probably, being around 10% of the whole asthma population, the prevalence of severe asthma is probably only 0.5-1%. Yes, the prevalence of asthma and severe asthma is much higher in Australia, New Zealand, the UK, Canada, some parts of Europe, but in fact, we do have a high burden of asthma in our part of the world here in Australia and New Zealand and many of the leading clinical research papers have come out of Australia and New Zealand for that very reason. We don’t know why there is more asthma in Australia and New Zealand, for instance or in the UK or Canada. Obviously we do have better epidemiologic records and so there may well be some underreporting, underdiagnosing in Asia of course, because access to medical services is not as good as it is in many other parts of the world. On the other hand, even when you do really rigours epidemiologic studies in Asia, the prevalence rates for asthma appear to be significantly lower than they are in, for instance, Australia, New Zealand and the UK. So it may be our Anglo-Saxon inheritance is really important, certainly most of us, strongly believe asthma is a consequence of genes and environment, you need both and so although we have a relatively clean environment, we have one that is very allergen rich, we have a temperate environment and fungi and mites and moulds and pollens, they all love our environment, so those sorts of exposures are one of the things that causes the inflammation of asthma – so, a range of different range of reasons, but we definitely do see lower prevalence’s in Asia than in Australia and New Zealand. Australia is a really stand out country, in terms of asthma clinical trials, clinical knowledge, expertise and strong methodology around asthma. Australia made asthma a national health priority back around 2000; we’ve built really good education into primary care settings, so primary care doctors are very aware of asthma as a problem. Although we don’t measure lung function nearly as often it should be measured to make the diagnosis, the clinical care of asthma is good and so we have that and on top of that we have really excellent academics; we have academic researcher’s in respiratory disease, in asthma and COPD who are leaders internationally and who’ve done really innovative, independent investigator studies as well as participated in many, very large, national and global randomised control trials. So we have experience, expertise, we have people who have the disease and who are willing to participate and we can conduct really good studies with reliable data. Asia is important because it’s untapped and it’s an opportunity and there is still a very significant proportion of the population who have asthma who don’t receive good medication and good quality care. So there’s a real opportunity to conduct clinical trials there and we at the George have basis in Asia, which enables us to do those trials really well to a very high professional standard and with the unique contribution that we have from the scientists in the George and the clinicians in the George along with our clinical operations capacity, we can really deliver very strongly in asthma and COPD studies. I think the future is bright for people with severe asthma, though it really depends how long they have had it. If you’ve had severe asthma all your life and you are now in your sixties or seventies you have probably lost a lot of lung function and as yet we don’t have any drugs that can turn that around. What we do have is medications that really significantly reduce symptoms and also exacerbation episodes were people land in hospital or they have to take a lot of additional medication. So I think the future is much brighter than it was but it is most bright for younger people who have severe asthma, because they are going to start treatments that are going to intervene in the disease much earlier and are then going to prevent the loss of lung function that happens of over time. If you have asthma that’s not well controlled despite optimal inhaled medications, then progressively you lose lung function and so getting a very good treatment late in your life is nothing like as good as getting a very good treatment early in your life and that’s what offers the really bright hope for people with severe asthma now. 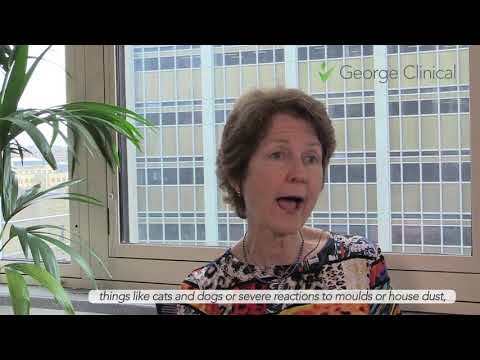 I’m professor Christine Jenkins, I’m head of the respiratory group at the George Institute for global health and I particularly run clinical trials here as a scientific leader. I am also a respiratory physician, I’m also head of the respiratory discipline at the university of Sydney and I chair the lung foundation of Australia. COPD is a disease that most people know as chronic bronchitis and emphysema, that’s the layperson’s term and what that describes are two things that happen to people with COPD. Their air passages become inflamed and they produce mucus and they develop cough and phlegm as a result of that. But also they lose lung tissue – that’s the emphysema part of it and the sacs that exchange oxygen become destroyed and that causes people to become very breathless. COPD can affect anybody, usually from their middle adult years, from sometime in their forties where their symptoms might be very mild, but it progressively worsens over time and it affects men and women depending on their particular exposures. Many women are not smokers, they develop COPD from biomass fuel exposure and dusty jobs or smoke exposure and men often, who are cigarette smokers develop COPD. COPD has a big impact not only for the patient but for their families, supporters and carers. The reason for that is that it causes progressive inability to do everyday tasks. People’s activities of daily living are significantly affected. But the other way they’re affected is that it’s really devastating to see somebody who is breathless and breathlessness at rest especially, which cannot be truly relieved; it’s very distressing to watch as well as to experience. COPD is a very prevalent disease. The WHO predicts that by 2030, COPD will globally be the third leading cause of death behind cardiovascular and cerebrovascular disease. So COPD is growing in prevalence because of the very wide spread exposure particularly to tobacco but still in many countries, to dusty jobs, biomass fuel exposure and significant irritancy that contributes such as air pollution. Air pollution is still a major problem especially in many parts of Asia and along with the other exposures it is contributing to the increase of prevalence in COPD. Asia is a really important region for running clinical trials in COPD. The main reason is that there is a big burden of disease and that disease is currently not optimally managed. Many Asian countries have guidelines for COPD management but one of the big challenges is access to good quality education, self-management, primary care and medications. There are real challenges in COPD trials that actually are not specific issues in many other studies; for instance, my experience of asthma trials, some of these problems never arise. One of the big problems for instance for COPD trials is that patients are usually unwell. Simply getting the patients to come back, be able to be at their clinic visits, be able to do all the producers you want them to do, whether it’s to exercise them, whether it’s to measure their lung capacity, whether it’s to fill out their diary cards consistently. Even using electronic diary cards because of the generation of patients, we need to take more time to teach them how to use these really important and valuable ways to measure their disease. Other issues are the fact that because the patients are very symptomatic they often don’t feel the drugs are making a lot of difference. We can measure the difference and particularly in large groups of patients, we can measure exacerbation rates are changing; that’s a key outcome for clinical trials. But in an individual it’s really hard to measure that, so the patients themselves may not know for the sure the drug is affecting them and are often tempted if they have an exacerbation to say ‘oh well it’s not working and I want to pull out’. So it’s really important you’ve got to really encourage the patients to stay in the trial and help them understand why they’re participation is valuable. I think the future is bright for COPD sufferers; although, many would say it’s been very bleak until recently, and there is some truth in that. We, for instance, had difficulty demonstrating that our key medications can change life expectancy. We’ve shown they change the course of the disease, they reduce the episodes of exacerbations that cause hospital admissions and they can improve quality of life, greatly. But actually impacting on longevity is still a massive challenge for COPD interventions. The other big, bright side of this is that there have been a lot of new COPD medications in the last five years. There are new members of each class and there are medications that last for longer and have fewer side effects. So I think the future is really bright and there are other things in the pipeline that are quite exciting but we’ve still got to test them and we’ve got to see for whom they’re best and it’s a rapidly evolving space.